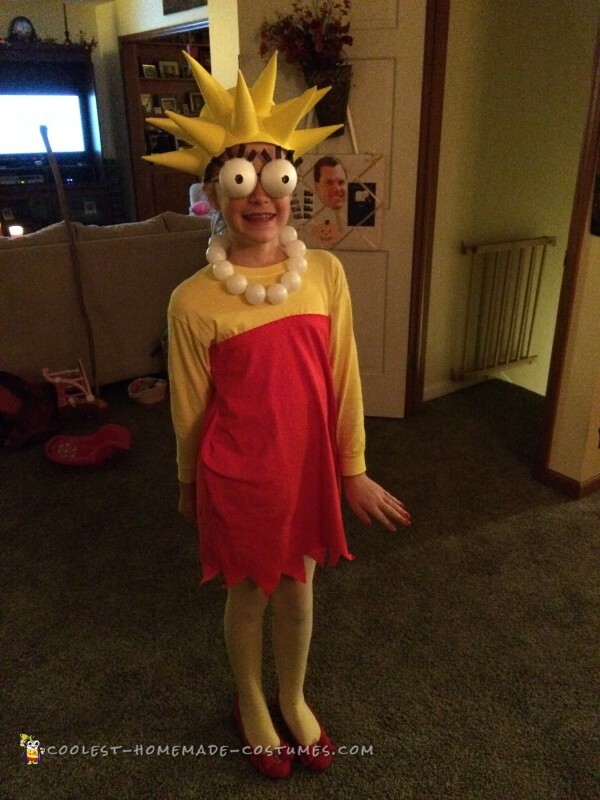 While watching the Simpsons, my son decided he wanted to be Bart for halloween. 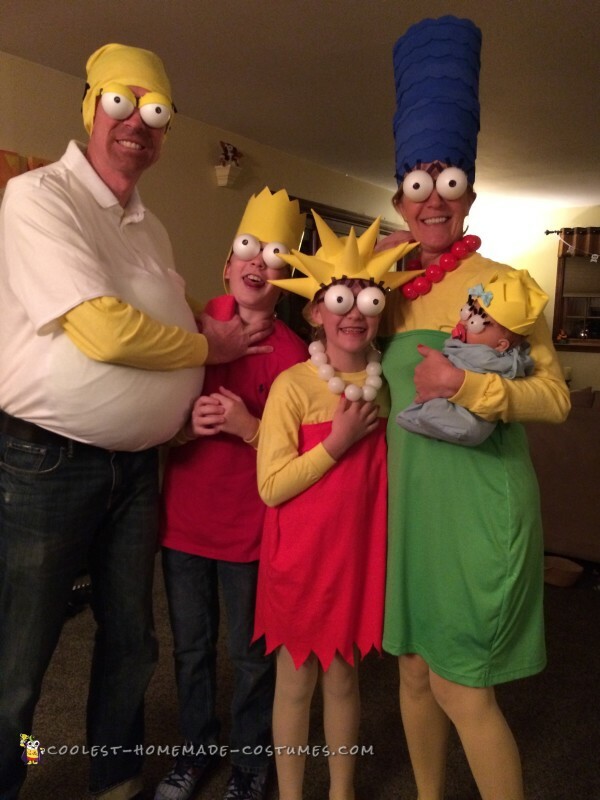 He insisted I buy him a costume, but I wanted us all to be the Simpson family for a neighborhood party and I didn’t want to spend much on my creation! I bought white long sleeve T-shirts and dyed them yellow for our skin. 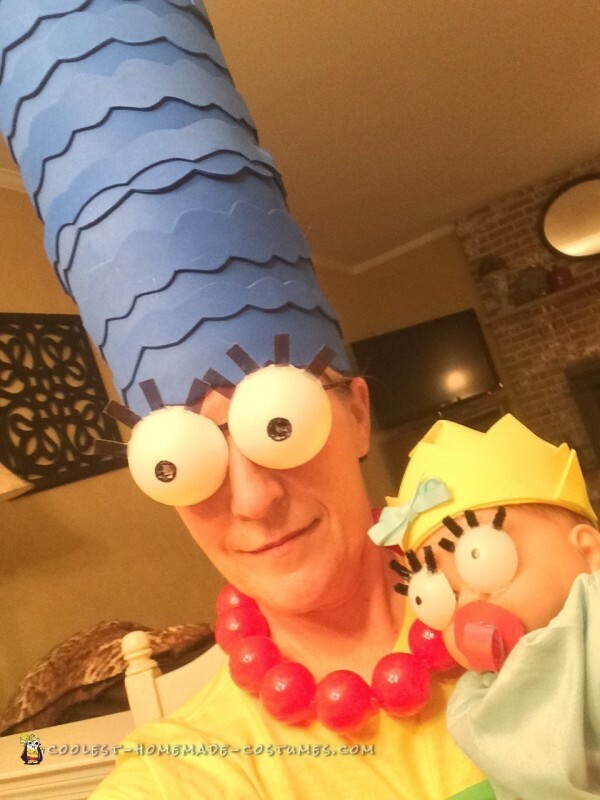 I got colored foam sheets for Bart, Lisa and Marge’s hair and used hot glue to get them into their styles! For Lisa’s hair, I shaped foam into cones and attached them to a headband. Bart and Marge’s hair are just glued into cylinder shapes. Extra peices cut into waves give Marge more dimension. Homer’s head was made from the same shirt fabric (cut from Marge’s shirt under her dress) and black pipe cleaners for hair. Brown makeup for his 5 o’clock shadow. Lisa’s dress was made from a $2 XL sleeveless shirt. Marge’s dress made also from a $2 XXL polo. Eyes are Styrofoam balls cut in half and glued to old eyeglass frames. Girls eyelashes are cut up pieces of sunglasses lenses glued to eyes. Lisa and Marge’s necklaces are ping pong balls (Marge’s spray painted red). Maggie is a doll with yellow foam hair, ping pong ball eyes with pipe cleaner lashes and construction paper pacifier. Homer has a pillow belly under his white $2 XXL polo and is carrying a duff beer cozy made from a downloadable printout. Yellow tights and red shoes for Lisa and Marge complete the family! It was so fun to make it all come together. I was simply giddy heading to the neighbor’s house! We were a bit hit at the party and lit up facebook with the photos! 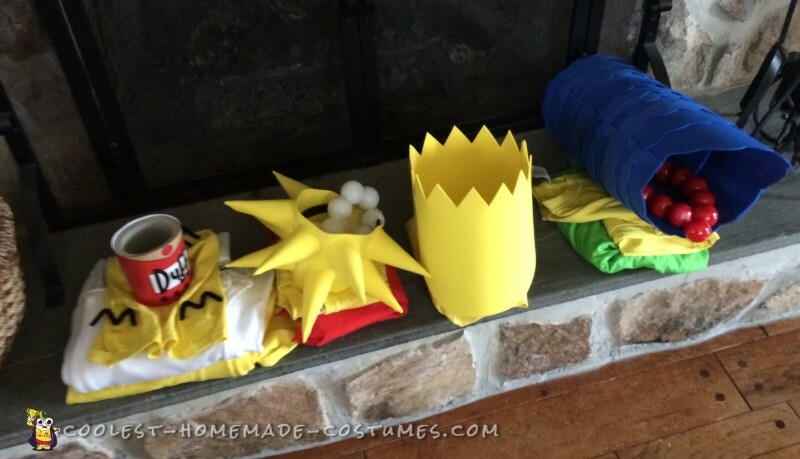 Homemade costume idea posted by Elaine W.